The Giants won the Super Bowl and last Friday's employment report shows the most jobs created since the 2008 crash, so everything's fine, right? 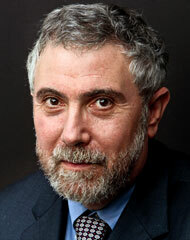 Not so fast, says Paul Krugman. Although "for once, falling unemployment was the real thing, reflecting growing availability of jobs rather than workers dropping out of the labor force," any recovery cannot be self-sustaining while we have "a sharp fall in household formation — econospeak for lots of young adults living with their parents because they can’t afford to move out." This is one of the chief impediments to a housing recovery. Unfortunately, Krugman maintains, many in the economic elite are quick to call for austerity at the first sign of positive news, and seem to direct their vigilance against an inflation that has failed to materialize for the last three years. So, a little good news could become bad news if it leads to more such economically retrograde behavior. None of this, however, should spoil the Giants' victory celebration - congratulations to Coach Tom Coughlin, Eli Manning & company!